Celebrity Trainer, Jeri Lynn Sunok, has worked her magic for more than 35 years, blending her fitness expertise with unique training techniques and tried and true healing processes. Jeri is all about upgrading personal training and wellness for the ages. After obtaining degrees in Physical Education / Sports Medicine and opening the very first private fitness studio in Beverly Hills, CA, Jeri earned remarkable respect as a well sought-after Personal Trainer and Fitness Director in both LA and Orange Counties. Jeri has always been ahead of her time and still is. Before the interval kickboxing / bodybuilding workout craze (known as HITT, Cross Fit), she was the creator of FITBOXING, a very popular cross-training workout. She also became famous for being FLEX magazine editor and co-author of early fitness godfather and guru Joe Weider’s book: "The Best of FLEX" - FLEXIBILITY. 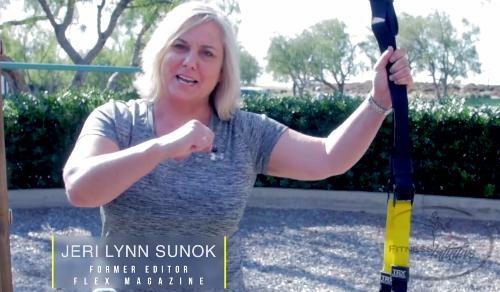 Jeri Lynn Sunok is the perfect commentator for fitness & wellness products. As an exercise pioneer, she expressively and genuinely maximizes the use of fitness tools and apps with her unique exercise methods and recovery strategies. With Jeri Sunok, professionals, supermoms, entrepreneurs and business owners realize and then maximize their physical, mental and spiritual potential. And she also coaches other personal trainers how to improve their skill set. Jeri practices what she preaches yet she is a realist. She enjoys a gourmet meal out (and is a great chef herself) while weekly maintaining her passion for the gym and the boxing ring. Jeri kicks and punches with a coach half her age, pulls a sled weighing 420-pounds, stacked with Olympic plates and a male trainer standing on top, and still masters her bodybuilding moves like dead lifts at185- pounds, or incline press with 55-pound dumbbells in each hand. And of course, Sunok meditates and “grounds herself” daily. Experience and see more than just a workout trainer; work with a Fitness Mentor who coaches you to a happy mind, happy body, and happy life! Jeri’s custom program design incorporates her use of meditative focus techniques; sharp kinesthetic sense, and her ground-breaking IVF, Instant Video Feedback. With her long history in fitness and wellness, Sunok can guarantee breakthroughs in most, if not all, areas where you've previously stalled. Let's Go! As a teen, Jeri Lynn Sunok entered athletic areas previously reserved for ‘boys only,’ well before most sports were en vogue for females and paying millions to women with brawn. 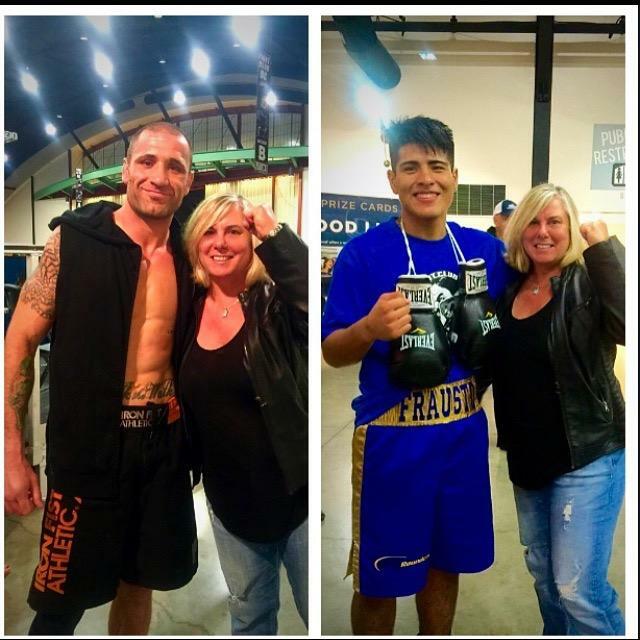 She even trained with champion boxer, Milford Kemp, and later with Muay Thai Kickboxing masters. As a result of a very difficult childhood and having to mature quickly, Jeri’s material for her writing originated with her innate grasp of human behavior, emotions and senses. Jeri soon realized she had a gift for heightened perception (or a sixth sense, if you will). Throughout her formative years, she blended these elements as a gateway and link between fitness and consciousness. As a star on her college softball team, she was involved with weight training in the 1980’s. And then Jeri became a competitive bodybuilder, adhering to a strict bodybuilding regimen. This occurred at the same time that she was studying sports medicine, working out at Gold’s Gym in Venice, well known as the Mecca of bodybuilding, and managing a celebrity-packed gym in Encino, California. Former clients include Kim Basinger, Sally Fields, James Brolin, Rick Dees and many others. Jeri went on to gain the respect and friendship of many of the big name directors, writers, casting agents, and actors she worked with; advising them on balancing life, work and fitness with humor. She also became one of the first female trainers to work out stars on location, on the studio lots. · Seen in GLAMOUR magazine as "favorite trainer for fitness tips," - September 2008.
and on PEOPLE magazine’s 50 Most Beautiful list. · Owner and operator of "first" private fitness gym in Beverly Hills - 1981. · Top Editor for major fitness magazines; over 100 articles published worldwide. · Originator of Fitboxingsm, a popular cross-training kickboxing program workout. · Co-author of FLEXIBILITY, with Frank Zane, in THE BEST OF WEIDER’S FLEX. · Currently working on her book series FITNESS INTUITIVE. Completed full Reiki training program; hands-on healing and energy techniques. Trainer for clients of all ages and levels, including people with muscle/health limitations. Specializing in weight loss, innovative stretching, atypical exercise skills, yoga, bodybuilding, kickboxing, breathing/meditation techniques, and conscious fitness education. Completed through founder Mary Hannigan. LaStone Therapysm uses multifaceted healing/massage techniques with hot basalt/cold marble stones. BEVERLY HILLS POST, ORANGE COUNTY REGISTER, LOS ANGELES TIMES, HEALTH, SOUTH BAY LIFESTYLE, OC METRO, and LIFELINE MAGAZINE. profitability. Created all marketing and business plans; handled all sales, schedules, contracts, and legal negotiations; trained employees; and expanded name recognition. in-depth coverage in a rapidly change field. Developer of Corporate Fitness Program for COLUMBIA /UNIVERSAL TELEVISION, on-location studio trainer, and promotions director for celebrities and executives. Traveled to gym locations to oversee entire one-on-one program. Fitness Expert Jeri and Emme present "Fashion that Fits"
" L. A. Charity with Ms. Olympia Linda Murray and Singer Thelma Houston"
FLEX -- "Armand Tanny, Joe Weider’s Editor with friend Jeri Lynn Sunok"
Fitness Interview - "The Father of Bodybuilding: Joe Weide"
LOS ANGELES TIMES -- "Pioneer Fitness Trainer to the Stars"
ORANGE COUNTY REGISTER -- Venture Feature: "Getting Their Kicks"
Buddihist Teachings, Boating, Film, and Writing Poetry.